Angle brackets get angry too! Four years after writing this post, it's still popular, and was recently featured on MakeUseOf. I'm pleased to say that in the past four years I've upgraded my phone twice (Most recently to a Nexus 5), and am still using the original mounting bracket. It's been holding up and serving me quite well! Riding my bicycle for over an hour a day as I make my way to work and back and around the city, I've often felt the need for a GPS. At other times, I would want a speedometer, so I'd have some idea at what speed I'm taking that slope. In this post, I'll show you how to safely attach your cell phone to your handlebar for less than $5. 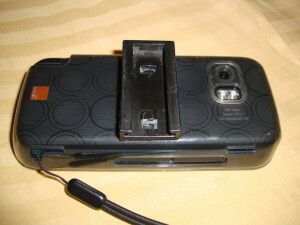 In my search for a solution to this need, I found this cheap universal cell-phone mount and went and ordered it. Unfortunately, this mount is really bulky and as a result shakes wildly with every bump in the road. I did not feel safe having my phone in it. In addition, its big thumb screw makes it an easy target for thieves. This was clearly not the solution for my needs. I envisioned the phone flush with the handlebar. This was far from it. I ended up making my own phone-mount, and it was as easy and cheap as can be. I took a detachable flashlight mount (similar, though not identical to this one), and glued it onto a silicone case I bought for my phone. I lightly sanded down the area on my silicone case where I was planning to glue the mount, in order to make sure the surface was free from chemicals & coatings, and to make it a little rougher, so the glue sticks better. Apply a thin, even layer of superglue, and firmly press the mount into place. Let it dry for about 20 minutes, and slide your phone into your new bike accessory. You can find good silicone cases for almost every imaginable phone here; many for under $2. So what does one do with a large-screen dashboard on one's bike? I've used MGMaps to get directions and navigate unfamiliar neighborhoods; Nokia Sports Tracker as a big-lettered speedometer and odometer (and as a bonus, it records your route so you can later analyze and share it); and Waze for voice turn-by-turn navigation. 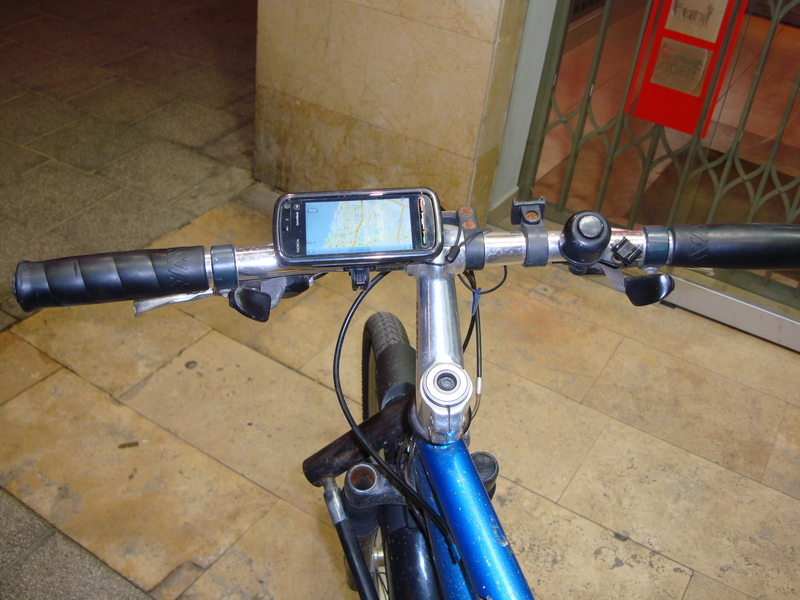 In addition, having your phone on your handlebar rather than your pocket allows you to see who's calling you. Video calls also work with the phone on the handlebar, pointing up at you. I've been stopped by fellow cyclists on several occasions and asked about the GPS on my bike. I hope that this guide will get some of you guys out there to try this for yourselves. Just the bewildered looks you'll get from drivers around you will be worth it. 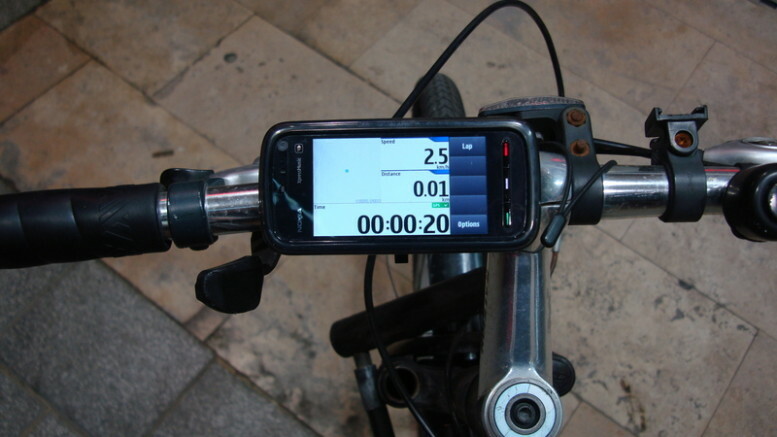 34 Comments on "DIY: $5 bicycle dashboard and GPS"
Was looking for that for awhile. and thought about mounting tham to my bike foe some time. I’ll be doing this asap with my Iphone. On the Iphone I recommend MotionX GPS. I tired 6 or 7 other apps and this one is awesome. If you only need to save 1 track at a time it is also free. כל הכבוד על הייצוג ב-lifehacker! I’d be a little concerned about the effect of the constant vibrations on my iPhone. Even with good front suspension I’d think this could cause problems eventually. How many miles have you put on with your phone attached? I’ve recorded some 75 km Nokia Sports Tracker, so I’d say I’ve had my phone mounted to the bike for approximately 100-150 km in total. Most all of this was on the road, of course. Though I do feel this is safe enough for a dirt trail, I would not do any aggressive biking with it. As for damage to the phone, I think the soft silicone offers some shock absorbing. In addition, the brace attaching it to the handlebar is rather tight, but not so tight I can’t rotate it by hand. so there’s some shock absorbing there as well. How about using good old fashioned velcro. Cheaper and just as reliable. And thieves? When you get off your bike, take your phone with you. The problem with Velcro is that is doesn’t grip the phone as firmly, and there’s nothing preventing it from rolling around the bar away from you. When I had my previous phone (a Sony Ericsson W530i with an HGE-100 GPS headset), I’d strap it onto my gloved wrist with a reflective velcro strip. For a screen-only phone, however, I think that this solution is better. to all people about to try this.. can I ask you to please stay off youtube while on your bikes. death by moron cyclist would not be my choice of method to leave this world. Great stuff! Next step, waterproofing against the great british rain…! Anyone any thoughts?! Sunil, in the past, I’ve placed my phone in a condom in order to waterproof it (when going on a hike that included neck-deep rivers). You should be able to put your phone in a (non-spermicidal) condom inside the silicone case. My concern then would be that you’re not keeping your eyes on the road while biking in the rain. 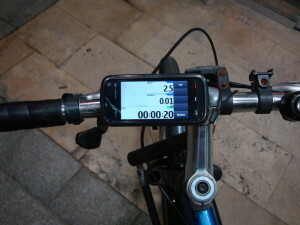 I center mounted my Sony Ericsson W760i on my road bike and after a few rides it’s proved to be quite solid. I use sportstracklive.com (used veloxgps.de before sportstracklive.com – both work very well) to plot my track and get my speed/altitude stats on my rides. Google maps gives me real time location plus full access to all the phone’s functions. Remove the reflective piece and mount a plastic base plate (I found a random piece and shaped it with a dremel), drill 4 holes thru the plate and reflector base and zip tie together. Hooks on the base plate, loops on the hard case. Done! It’s not waterproof, but then again, I try to avoid riding in the rain at which point I’d just put the phone elsewhere. As far as shock, the velcro seems to do well with road biking, I can’t speak to mountain biking. Additionally, I’m going to supplement the power (GPS can drain the battery) by adding a small AA battery powered under the mount. nice idea. but i guess this increases of accidents. what if the rider jump onto facebook and forget that he is riding?!! How come, on the Nokia Sports Traker there isn’t software version for the Nokia 5800! Where did you get it? Fortunately for us, the guys who developed NST have now taken this product private, and it’s being developed independently of Nokia. What this means is better maps (OpenStreetMaps rather than Ovi maps) and the promise for compatible heart rate monitors in the near future. Nice, did something like this myself recently. Except I used a mount from an old broken GPS, which was very similar to this one. Works awesome, to anyone using an iPhone the program called “TheBike” will record your speed, route and more and upload it all to a site where you can see it over layed with google maps. I found a few potential mounts for my smart phone online, but they all looked either like overkill or like something I couldn’t really trust to hang onto my phone when the ride gets bumpy. This post inspired me to take dremel tool to a cheap spare handlebar-mounted flashlight to get the latching mechanism, which I then superglued to a sanded surface of a silicone case that I bought with my phone but haven’t used up until now. Fifteen minutes of cutting, sanding, and gluing in my garage, and I’ve got the perfect smart phone mount. Mike, I’m really glad to hear that you made yourself a bike-mount based on this! Got any photos? I think your phone will be fine. The iPhone is made by hand and of the most sturdy parts available. What’s most important is that in the mount itself the phone does not rattle, and it looks as if he did this right. Nice work, Ethan. I love this idea, and it was something I was toying with myself. I just have one reservation, what about rain? I still ride in rain, but all so called all-weather mounts out there are universal and as such don’t actually fit any phones properly at all! Any ideas or “mk2″ versions to incorporate something waterproof/resistant? Very nice! Maybe you could also work on a dinamo that keeps battery charged….maybe useless idea but you may want to listen to some music, shoot video, answer calls, etc etc etc. I still haven’t been able to find a nice, clean-looking mount like this one. So, I am attempting to build one for my Nexus 4, using http://www.amazon.com/gp/product/B00CL6FXGM/ref=as_li_ss_tl?ie=UTF8&camp=1789&creative=390957&creativeASIN=B00CL6FXGM&linkCode=as2&tag=madabil-20 and http://www.amazon.com/gp/product/B00A06Z9T6/ref=as_li_ss_tl?ie=UTF8&camp=1789&creative=390957&creativeASIN=B00A06Z9T6&linkCode=as2&tag=madabil-20. I’ll let you know how it goes; thanks for the tutorial! Those look like great items to use for this hack. an $0.89 phone case is great, though I hope it’s not too flimzy. Please do follow up once you’ve done it! The phone case was actually 1 cent when I bought it! I’m still waiting for the flashlight mount to get here, but I’ll be sure to let you know how it goes. Was the case you used the silicone flexible type, or was it harder and more rigid? When I buy phone cases, I make a point to get TPU cases. It’s more rigid than silicon, but soft and doesn’t break like some other plastic cases. I wouldn’t subject my phone to the jolting forces of being directly secured to the front handle as it’s just too darn much for a phone to handle for the long term. If possible use an upper arm pouch so that your arm absorbs most of the jolting and doesn’t transfer it on to the phone. it’s now been 4 years since I wrote this blog post. I’ve since then upgraded my phone, and have the new one attached in the same exact manner. Thousands of kilometers of both road and cross-country cycling and a handfull of falls later, the phone has never fallen off or shown any sign of damage. You would be much better off using something like JB Weld, as it actually chemically bonds plastics, instead of just sticking them together. Superglue is going to fail sooner or later, particularly in such a rigorous environment. Yes, the good glue adds to the cost, but it also saves you from replacing your phone. I’ve had no problems at all with the superglue I’ve been using. Four years in, and still holding strong!